The images below were created for an exhibition focused on a specific theme or for a special project. Enjoy! The two images below were created for Silent Skies, the artistic centerpiece for the International Ornithological Congress slated for September 2018 in Vancouver. The exhibition, which includes over 600 bird images focused on the IUCN's Red List, will raise awareness for avian conservation everywhere! The IUCN or International Union for Conservation of Nature is the global authority on the viability of the natural world. 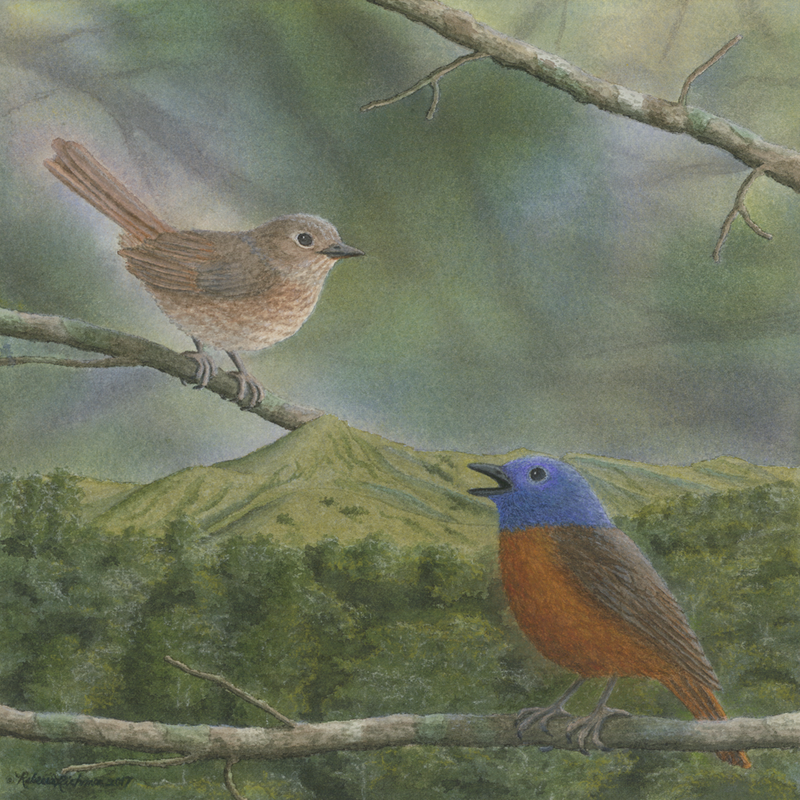 Home for Amber Mountain Rock-thrush ~ Watercolor & Pastel ~ 8 x 8"
The Amber Mountain Rock-thrush is on the IUCN's red list and has been found only in Madagascar's Amber Mountain massif. The bird's population is estimated to be less than 5,000 due to habitat loss and deforestation. As you view the image, feel the optimism as the brilliantly colored male sings to his mate with hope for a bright future. We can restore balance in our natural world! Yes we can! 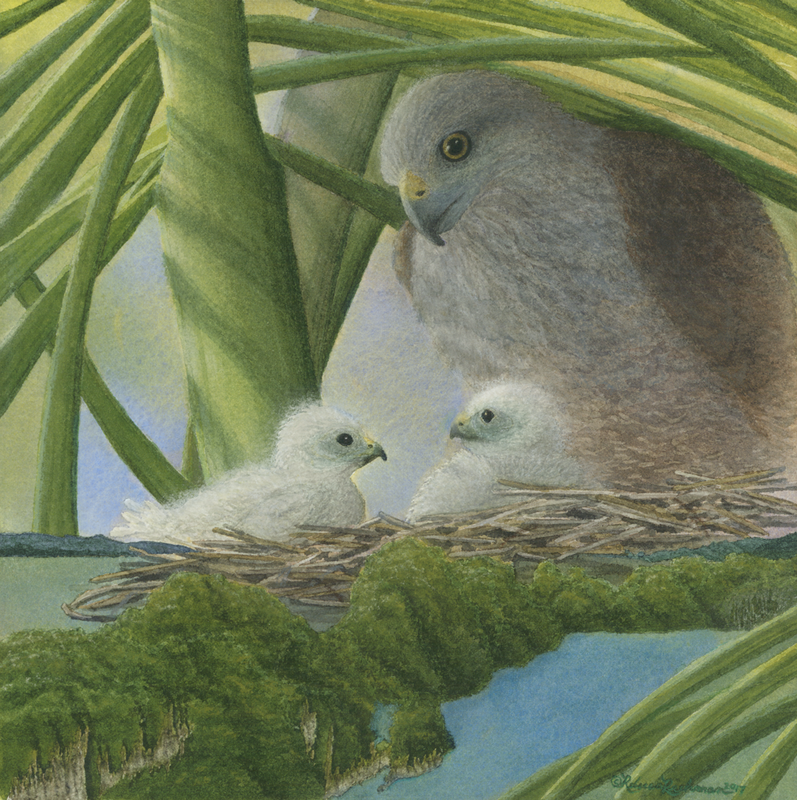 Home for Ridgway's Hawk ~ Watercolor & Pastel ~ 8 x 8"
​The Ridgway's Hawk is on IUCN's red list with an estimated population of only 300 birds left in the world. Dr. David Anderson is the director at The Peregrine Fund and he is working with other dedicated scientists, staff and volunteers to save these amazing birds with support from Morris Animal Foundation, the global leader in advancing science to help animals live healthier lives. Ridgway's hawks are now only found in isolated areas including Los Haitises National Park in the Dominican Republic, one of the bird's last strongholds due to habitat loss, human disturbance, and botfly infestation. If you look closely, the beautiful islands in this national park are supporting the nest in my image as a symbol of how important this area is to the hawks. 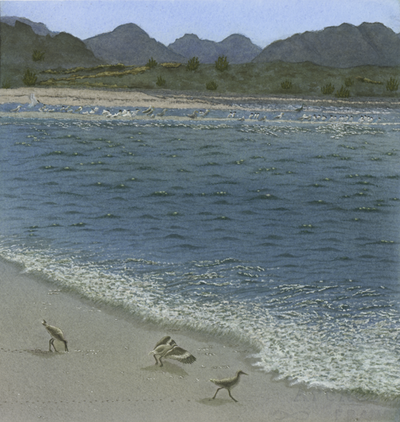 The Sea of Cortez, “where the desert meets the sea”, is a landscape where beautiful blue waters, diverse bird species, whales, dolphins, and even the Sonoran Desert thrive. 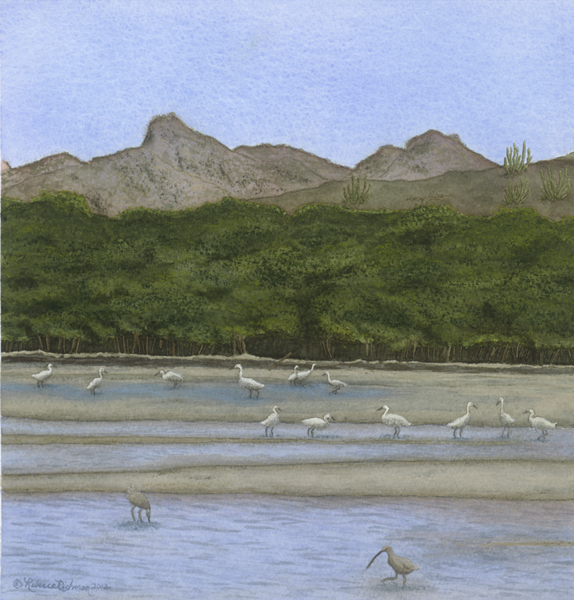 I was part of a group of artists who was invited on an expedition to San Carlos, Mexico to create work focused on this amazing place. I loved walking along the beach picking up sea shells, examining the colorful seaweed, stones and life forms washed up on the sand. 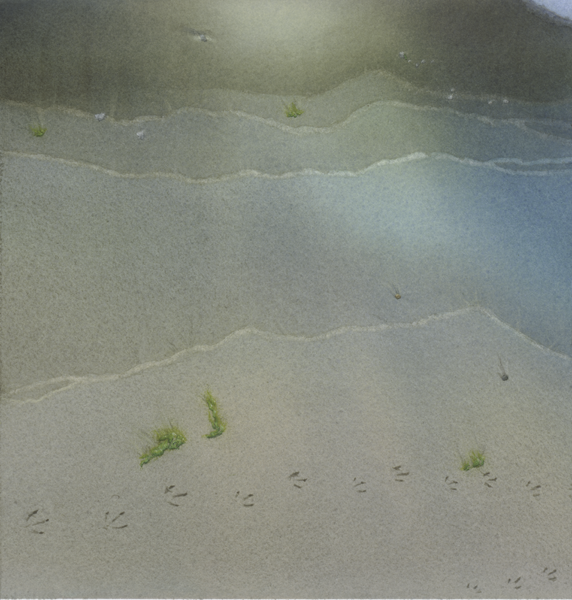 Footprints held my attention; markings of creatures on their travels, moving from place to place in a brief moment of time. ​In the tapestry of life, where threads are species weaving together the most magnificent patterns of biodiversity, it’s the space between the threads that also matters. This space, made up of invisible connections, is what creates viable ecosystems; naturally in perfect balance and harmony. Desert Waves ~ Watercolor & Pastel ~ 10 x 29"
Mystery flotsam is a life form that is unidentifiable to scientists. I found these tiny, transparent “creatures” fascinating during my daily walks along the beach. 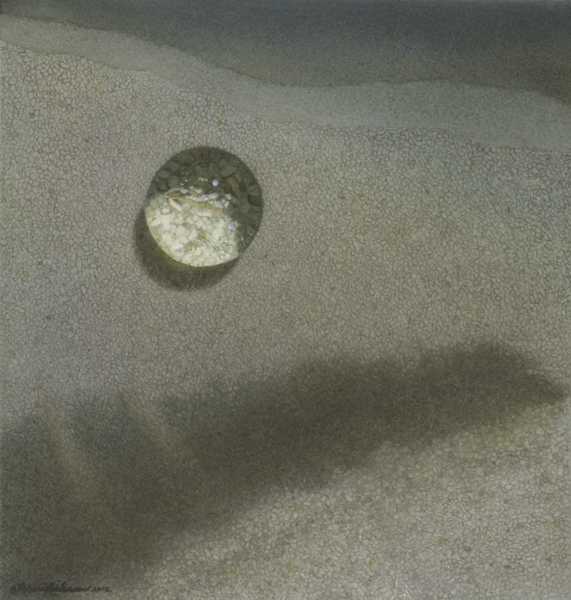 To show scale in this painting, I’ve placed a flotsam close to the tip of one toe of a willet footprint. That's how small they are! As I watched the waves roll in and then fall back into the beautiful sea, I saw interesting patterns left behind in the sand that mirrored the outlines of the surrounding desert mountains. 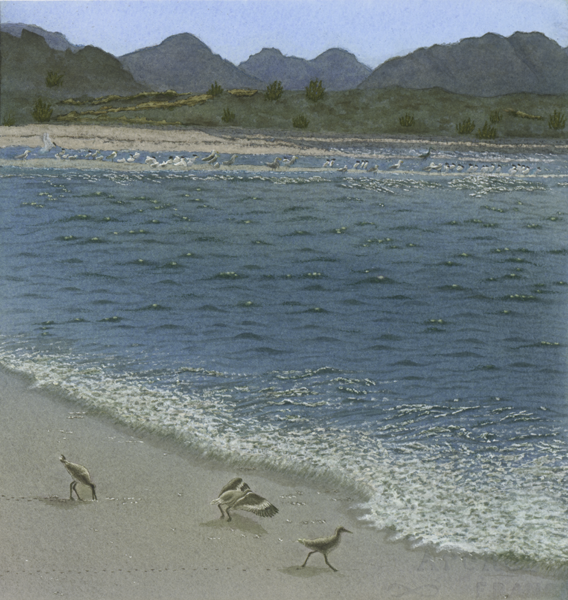 Each of these three images is connected to the next by continuous lines of sand, sea, and mountains. In nature, we see connections everywhere. ​Footprints of willets connect scale. Grains of sand create ecosystems. Waves create mountains. 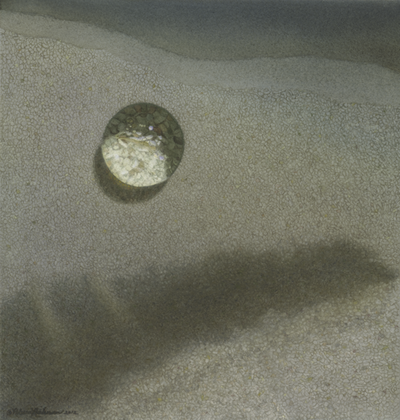 In my painting, Desert Waves, it’s a matter of scale; small mystery flotsam connected to the great sea or grains of sand to the mountains. Biological diversity is alive in the tiny, and it’s alive in the massive. 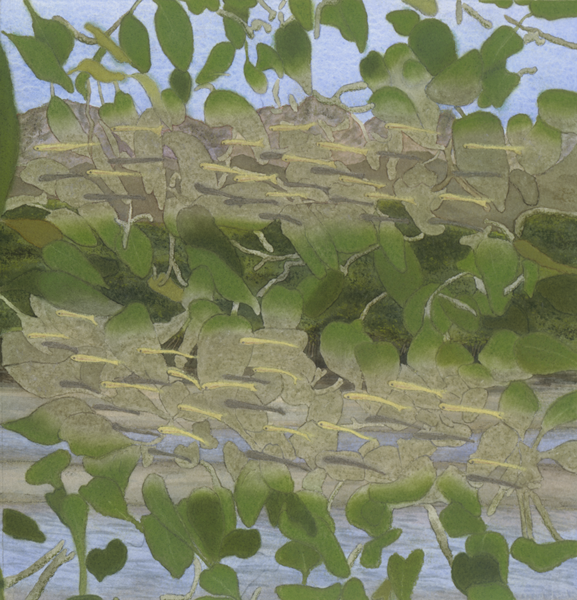 Estero Reflections ~ Watercolor & Pastel ~ 10 x 29"
The word “estero” means estuary in Spanish; an estuary is a tidal inlet of the sea. 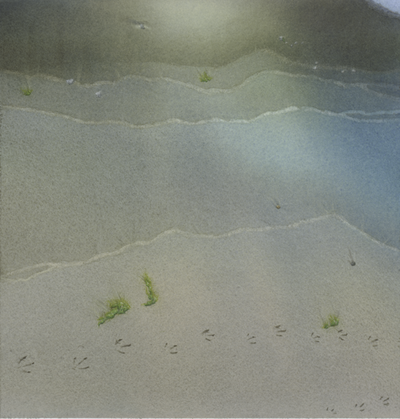 Depending on the time of day and the tide, different creatures are active. 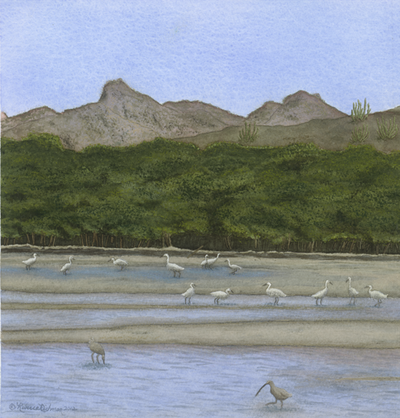 On one visit to the estero, I watched a group of little egrets feeding on small fish. Two long-billed curlews accompanied them. Many shorebirds depend on mangrove estuaries not only to provide food, but as a safe place to nest and raise their young. So much bounty in this coastal nursery! During my visit to San Carlos, I was lucky enough to be guided by Dr. Rick Brusca, marine biologist and conservation ecologist extraordinaire. When we ventured into the mangroves, I was amazed at the incredible diversity of invertebrates everywhere. In this painting, I highlight one very beautiful crustacean, the blue crab. Its scientific name, Callinectes sapidus, means “beautiful savory swimmer”. 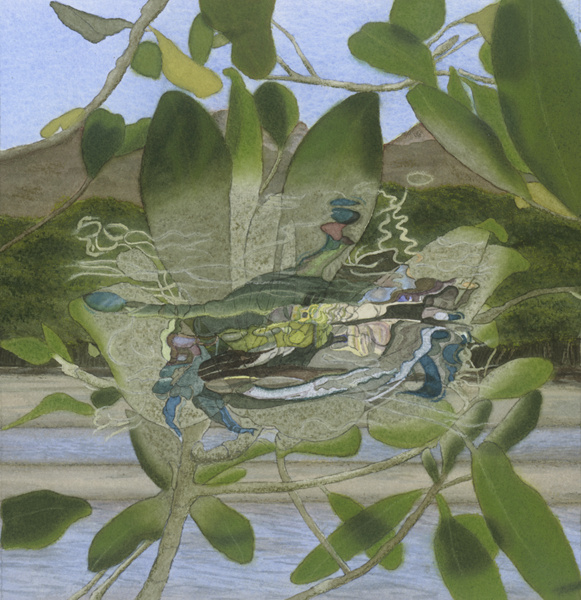 Blue crabs connected to mangroves, mangroves connected to estuaries; all beautifully in balance. Among its many gifts, the estuary’s shallow water is a safe haven for fish to lay their eggs; where fingerlings can hatch and grow. I saw small schools of fish everywhere, especially during low tide. No wonder this was such a magnet for bird life! The mangroves themselves were quite amazing, too. 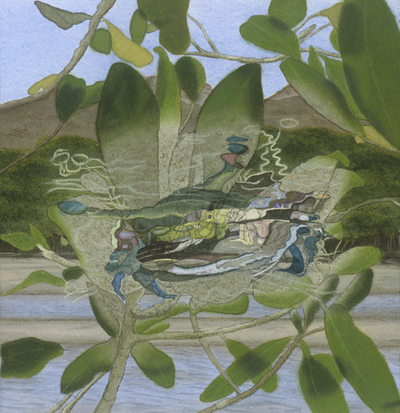 In this painting I highlight the red mangrove, and the sweet mangrove which exists nowhere else but the Gulf of California. As Dr. Brusca and I tromped around in the mud and thick mangrove stands, I learned about the specific role these plants have as filters of salt water, assimilating and dissolving nutrients. 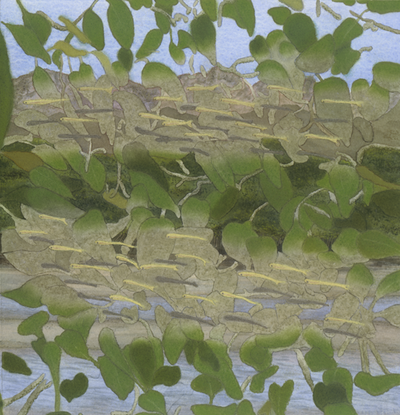 Mangroves benefit the environment by actually improving water quality. How awesome! 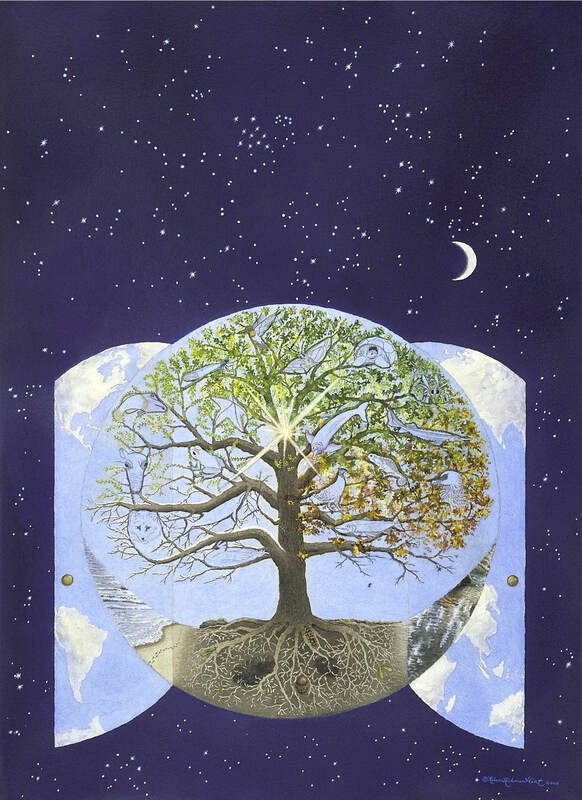 This painting was created for the cover of Gaia Speaks: Sacred Earth Wisdom by Pepper Lewis, world-renowned author & teacher. The night sky beckons us and the universe embraces our planet with a quiet stillness. The Earth, represented by the circle, is safely nestled among the stars, basking in the sparkling brilliance all around. Within the circle is the Tree of Life and between the leaves and branches of the seasons, we see 18 creatures from all over the world; bar-headed goose, arctic fox, southern minke whale, saiga, poison-dart frog, cushion star, fairy basslet, river jewelwing damselfly, ruby-topaz hummingbird, glanville fritillary, giant tortoise, honey bee, amazon river dolphin, sturgeon, chameleon, tragopan, lammergeier, and atlantic salmon. These life forms have been placed in the space between branches to highlight the delicate interrelationships that connect us all. The great sea flows in rhythm and a gentle stream dances playfully; our beautiful waters nurturing all life on Earth. Opening from the circle, we see rounded doors inviting and welcoming us home. The sky becomes the sea and the clouds become continents; all in perfect balance and harmony.